I guess I’m hopelessly addicted to HGTV these days. Mostly because they’ve got some great ideas that I plan to incorporate into our new log home. This morning, on Room By Room, hosts Shari Hiller and Matt Fox showed how to create a festive atmosphere in any room. Having visitors for Christmas this year? Then you’ll enjoy these fun ideas that were featured on an HGTV episode entitled “The 12 Projects for the Holidays”. 1. Change a dining room table into a simple, yet festive and warm holiday space by adding some colorful place mats (layered), personalized place cards, candles, ribbon chair accents and holiday decorations on the furniture. 2. 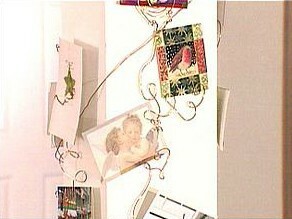 Turn any pillar or column inside your home into a holiday card holder using some thin wire and needle-nose pliers. 3. Make a sparkling glass ornament centerpiece using floral foam, thick wire, and glass ornaments in many different shapes and colors. 4. Add a “pop” of color to an accent wall or an entire room with paint. 5. Layer window treatments to make a room cozier. 6. 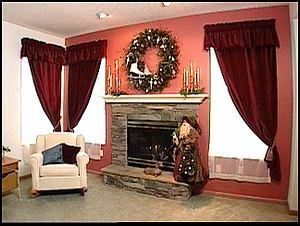 Use area rugs to lend warmth and create a nice foundation for holiday decorations. your mantel to enhance the fireplace area. 8. Make personalized place cards from some tiny beaded ornaments and 16-gauge wire. 9. Dress-up an existing corner plant with a few strings of small lights and add some garland of juniper branches (embellished with greenery and sugared berries) on a chandelier. 10. Draw attention to your fireplace by adding some brass candlesticks and ivory candles with juniper around the bases. 12. Spread an accent color around the room and repeat similar elements throughout your space. For example, use the same greens, sugared berries, and glass ornaments on garlands, wreaths and in bowls.